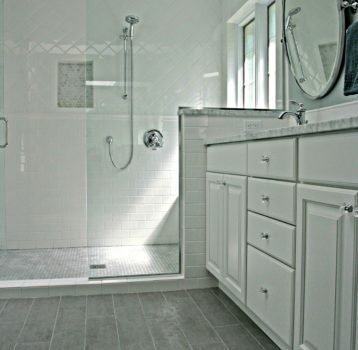 Split French door with frosted glass, painted wood cabinetry in both regular vanity depth and reduced depth, The Onyx Collection shower panels and vanity top with integrated sink, Kohler medicine cabinet with interior mirrors, and Luxury vinyl tile flooring. 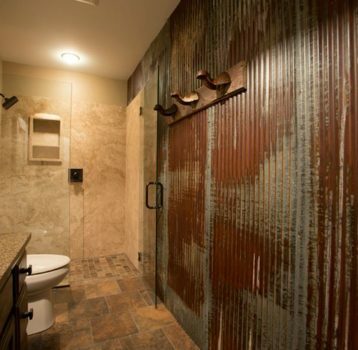 Although doors are pretty much necessary on bathrooms, sometimes it is the door that proves to be a huge obstacle to usable space. In this bath remodel, as the original door opened into the space it ate up a significant chunk of the floor area and made an already tight space seem very closed in. As a stylish solution, these split french doors were added to now swing out into the hallway. Frosted glass panels allow light to pass through but maintain privacy. From here, the new clean and cool finishes are as serene and relaxing as the totally pink was appalling. 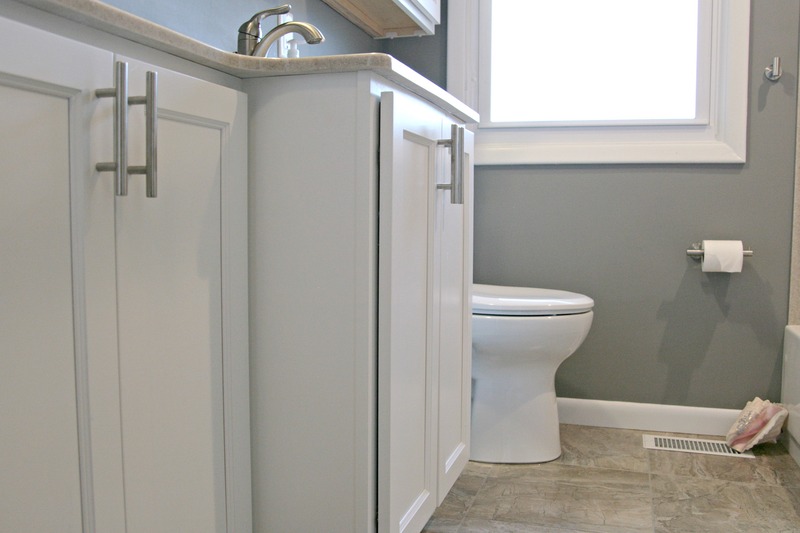 Losing the soffit above the tub/shower, maximizing storage with creative depth vanity cabinetry, above toilet cabinetry that balances the room and a work horse of a medicine cabinet make this small bathroom function with the best of them.